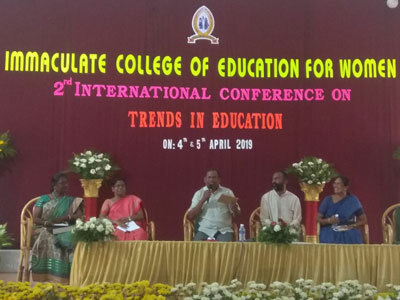 Shivakumar, Director, Sri Aurobindo Foundation for Integral Education and Research (SAFIER), was invited to be a Panel Expert for the Second Two-day International Conference on ‘Trends in Education’ organized by the Immaculate College of Education, Puducherry. About 120 participants, including research scholars, B.Ed. and M.Ed. students of the college, attended the programme, besides faculty from Immaculate and a few other colleges of Puducherry. 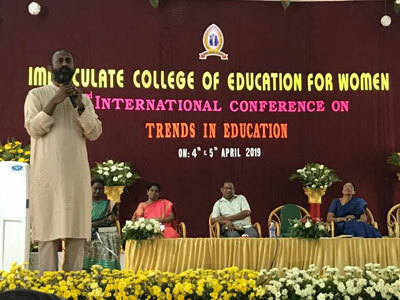 During his interaction with the participants, Shivakumar gave a background of the Integral Education being practiced at the Sri Aurobindo International Centre of Education (SAICE) of Sri Aurobindo Ashram, and the deep impact it is having on the emerging trends in education all over the world. While introducing the topic value education, he underlined the reasons for it being least effective as it has not produced people of great character and force. And then he took up the discussion on how to impart values and said that values cannot be taught in an academic way, but the teachers, parents and the society themselves have to be practitioners of these values. While stories that symbolize great values and character of people are important, it is also important to adopt a ‘near to far’ approach, by starting with the practicing of values by the students in a gradual and graded way and first in a surrounding familiar to them. Once the teachers and the students begin to practice values at their homes as well as in the schools and colleges, the subject of Value Education becomes effective in transforming the character of the students. 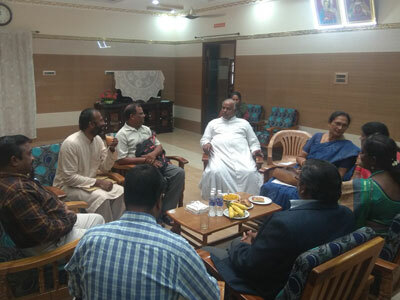 After the discussion, Shivakumar had an informal discussion with the other panellists on Integral Education and the gradual introduction of its core principles into the existing educational institutes so that the educational process can be strengthened.